There are some airports out there that are so large, famous, and iconic that their airport codes are known all over the world. JFK Airport in New York City is one example, and LAX Airport in Los Angeles is another. LAX is the airport code for Los Angeles International Airport, but most people, especially Los Angeles natives, simply refer to the airport as LAX. This is the main airport for the city of LA and is located around 18 miles outside of the Downtown district of the city. LAX is the second busiest airport in the entire United States in terms of passenger traffic, trailing only to Hartsfield - Jackson Atlanta International Airport. It handles over 87 million passengers each and every year, making it the fourth busiest airport on the planet. It's the main gateway to the United States for flights traveling over the Pacific Ocean and landing on the West Coast and is also an exceptionally busy cargo airport too. Since LAX is such a large and iconic location with so many passengers to look after every single day, it offers a lot of different amenities and facilities for everyone to enjoy. You'll find a lot of interesting shops around LAX Airport, for example, and if you start getting hungry or thirsty, there are dozens of different dining options to choose from all around the different terminals. See below for brief overviews of some of the best places to eat at LAX. LAX is an enormous airport with eight numbered terminals and the Tom Bradley International Terminal too. You can find dozens of different restaurants and dining locations all around this airport, with several locations to be found in each and every terminal. Here are some details on just a few of the very best places to eat around LAX, but this list is by no means exhaustive and you may find a few other favorites of your own if you search around the various terminal buildings. If you're flying out of Terminal 1 at LAX, Cassell’s Hamburgers is one of the best places to grab a bite to eat. It's a simple burger joint that really nails the basics of making a good burger, focusing on good quality meat and fresh ingredients every time. Terminal 2 is one of the less impressive options at LAX when it comes to dining, but there are still a few good spots to eat well around this terminal, and Fresh Brothers Pizza & Sandwiches is one of the best. With a big focus on fresh ingredients, this place provides a really nice range of pizzas, sandwiches, salads, and snacks. 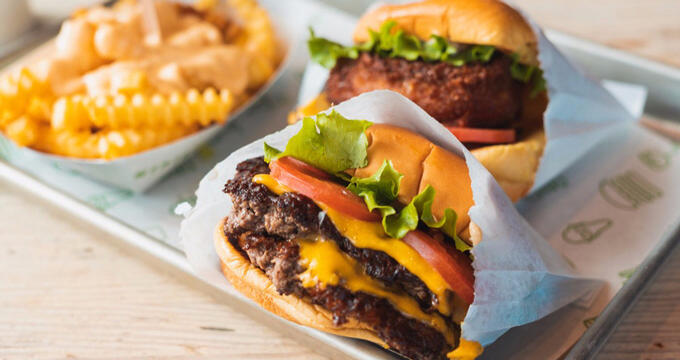 Founded by New York City restaurant pioneer Danny Meyer, Shake Shack has become a global sensation since starting out as nothing but a simple hot dog cart in the Big Apple. There's a Shake Shack over in Terminal 3 of LAX and it's open really early in the mornings and late in the evenings too, so it's always a reliable option. You'll find some tasty burgers, hot dogs, fries, and those iconic shakes at this place. A historic sandwich creator that has a history dating back over a hundred years now and is best known as the 'originator' of the French-dipped sandwich, Cole's is always a great place to grab some quality food in LA and has its own branch at the airport too. As well as sandwiches, this place serves some stellar cocktails. Similar in style to a Hard Rock Cafe, Rock & Brews Concert Bar & Grill offers an awesome menu of American classics like burgers, sandwiches, salads, and pizzas, all located within a rock and roll-themed location with great music and eye-catching furnishings to be admired throughout your meal. You can choose either a sit-down or take-out meal at Rock & Brews Concert Bar & Grill. No trip in or out of California can be complete without trying an item from the menu at The Habit Burger Grill. This California burger chain has received a lot of plaudits from critics and casual foodies alike over the years and you can see what all the fuss is about over in Terminal 6. There are some chains you can always trust, and Wolfgang Puck Express is definitely one of them. When you just have a craving for a top quality slice of pizza or a delicious sandwich, this is a great place to go, with a menu devised by one of the world's favorite celebrity chefs. Terminal 8 really does have a whole lot to offer in terms of eateries, especially when compared to some of the other terminals, but Engine Co. No. 28 definitely stands out as one of the top spots to eat in this terminal. It's a full-service bar and restaurant, so you can grab a chair at the bar or enjoy a full three-course meal in the restaurant area whenever you like. You'll find timeless American favorites here like burgers, fried chicken, chowder, and more. If you're jetting off somewhere exotic from the Tom Bradley International Terminal at LAX, Ink Sack (stylized as ink.sack) is a good place to eat. The prices are especially affordable here and you can find an amazing blend of Asian, European, and American flavors and influences all coming together in one place. Also, in the Tom Bradley International Terminal, The Border Grill is a really stylish location that catches the eye of millions of travelers passing through LAX every single year with its cartoonish black and white decor and sleek modern seating plan. This place serves some of the best Mexican food you can hope to find at LAX.